Living in California, many times I’ll see some people walking slowly along the beach with a strange object in their hand, waving it over the sand. When I asked my parents about it, they informed me that people come to the beach after a busy weekend to find trinkets and treasures accidentally dropped in the sand by the weekend visitors. They said the device they were carrying was called a metal detector and it would tell them if anything of metal was buried just below the surface of the sand. I immediately had dollar signs floating before my eyes and wanted to run out and get myself a metal detector. Of course, after watching these treasure hunters spend hours in the hot sun searching for treasure, my dreams of wealth blew away with the ocean breeze. Now that the theme of this month is Trinkets and Treasures, I was curious once again about those metal detectors and how they worked. Metal Detecting can be broken into two categories: discovering history and finding treasure. 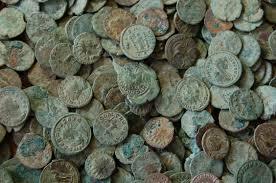 Metal detecting can discover history by uncovering buried coins or relics. Many times coins and relics are found together. Coins can be found in a park, old homestead, or other old gathering place. These places can be found by visiting a local historical society, museum or your local library. There may have been area history books written about an area, or there may be an area in your library for local history. Relic hunting takes you back to previous centuries and usually involves fairly old finds. War relics include bullets, swords, buttons, boiling pots, and camp supplies. While finding relics can lead to discovering interesting stories, they usually don’t amount to much profit if you were to sell them. Even archaeologists use metal detectors to look for ancient buried ruins. Other people use metal detectors to make a profit by finding gold and other precious metals. The two categories of “treasure hunters” are Beach and Water detecting, and Prospecting. Beach metal detectors are used to find lost jewelry, dropped coins, or maybe even Spanish treasure from a shipwreck. 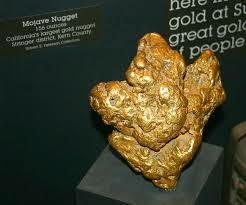 Prospecting is the use of metal detectors to find nuggets left over from previous gold-rush days. It is the hopes of finding lost gold (either forgotten or never found) from many years ago. So if you decide that you want to begin this as a hobby, you can pick one of the areas of detecting and possibly branch out into others. The same metal detector can be used in multiple areas. How does a metal detector work? 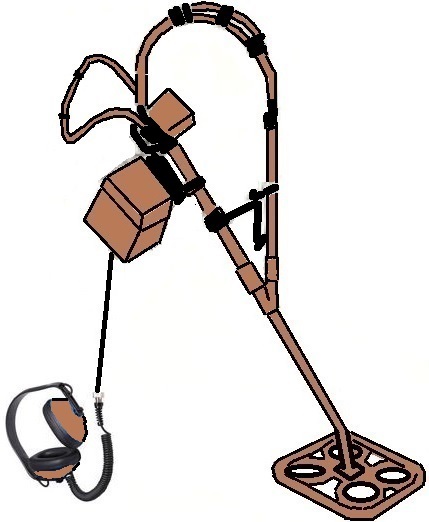 A metal detector typically has four main parts. Stabilizer – used to keep the unit steady as you sweep it back and forth. Control box – contains the circuitry, controls, speaker, batteries, and the microprocessor. Shaft – connects the control box and the coil. Search coil (search head, loop, or antenna) – the part that actually senses the metal. Additional pieces may also be included, such as a jack for connecting headphones, a control box below the shaft, and a display unit. The battery allows you to turn the metal detector on without a cord. Move the unit’s search coil slowly over an area in front of you. When it passes over an object, an audible signal occurs. More advanced (and more expensive) metal detectors provide displays that pinpoint the type of metal it has detected and how deep in the ground the target object is located. The most common technology used in metal detectors is VLF (Very Low Frequency). Very low frequency is also known as induction balance. It uses a transmitter coil and a receiver coil. The outer loop transmitter coil sends electricity in one direction and back again. The receiver coil contains a coil of wire that acts as an antenna to pick up and amplify frequencies coming from metal objects in the ground. The current moving through the transmitter coil creates an electromagnetic field. Each time the current changes direction, the polarity of the magnetic field changes. As the magnetic field pulses back and forth into the ground, it interacts with any conductive objects it encounters, causing them to generate weak magnetic fields of their own. The receiver coil is completely shielded from the magnetic field generated by the transmitter coil. However, it is not shielded from magnetic fields coming from objects in the ground. When the receiver coil passes over an object giving off a magnetic field, a small electric current travels through the coil. This current fluctuates at the same frequency as the object’s magnetic field. The coil amplifies the frequency and sends it to the control box of the metal detector, where sensors analyze the signal. The metal detector can determine approximately how deep the object is buried based on the strength of the magnetic field it generates. The closer to the surface an object is, the stronger the magnetic field picked up by the receiver coil and the stronger the electric current generated. To begin, find your machine. You don’t need to spend a lot of money on a machine. They start as low as $50 and can go into $1000s of dollars. It is not so much the cost of the machine that determines whether you find a treasure, but the way you use it. Be sure to read the instructions and practice, practice, practice. Find other people using metal detectors and talk to them about hints and what works for them. Make a testing area around your own home, burying various items (bottle caps, coins, jewelry) at different levels and try out your metal detector. You can then become familiar with the readings and noises on the machine and the best way to swing the machine to identify the items. After you have your device, choose your location. Do some research on the internet or the local library to find where old buildings existed that might have had a lot of foot traffic. If you can’t find the information at the library or the local historical society or museum, you might have success by looking at old aerial maps and plat maps to look for areas where people would congregate such as playgrounds, sports fields, hiking trails, schools, and campgrounds. Check with your local city and see if they’ll allow you to do some metal detection in areas where the sidewalks or streets are being torn up or construction is occurring. These are good places to find old coins or artifacts. Be sure to check the law to determine that you can use metal detectors in outside areas. Using it in a National Parks battlefield site is usually not allowed and you don’t want to be arrested or have your machine taken away. Before venturing on private property, get permission or you may be arrested for trespassing. There are many public places that allow it, however, so just check and make sure. The metal detector gives different signals for different objects. When practicing, dig every signal so you can associate various signals with the particular items. Small pieces of jewelry can sound just like a pull tab or piece of foil. Remember practice and patience will teach you to be good at this hobby, just like other types of hobbies. You may even want to practice in the rain or directly after a rain. 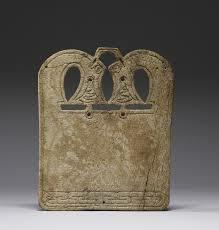 Rain allows metal detectors to see deeper and the rain may also rise up some previously buried items. You must always fill back in the holes you dig. Leave no trace that you’ve been there. 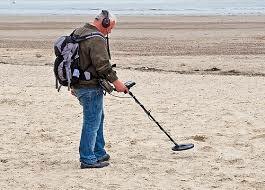 Using a metal detector is a great way to experience the joys of treasure hunting. You also get to enjoy the outdoors and possibly discover a bit of history. Experience it alone or get a buddy to learn it with you. Who knows? It might be a lifelong hobby. Good Luck!